The same great community tools that power the new itch.io global community and jam communities are now available for all of your game and other project pages. You’ll find the two options on the bottom of your project’s edit page. 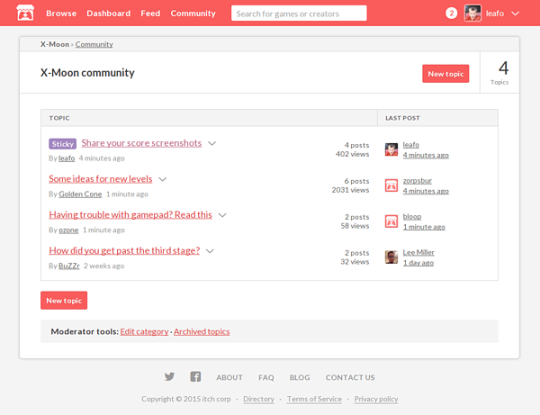 Game communities come with all the same moderation tools as any community on itch.io, including: electing moderators, moderation logs, topic sticking & locking, banning, and managing reports. Additionally you can include community rules and optionally enable likes or up/down voting on posts. You’ll find all of these tools and more on the community page, and the new “Discussion board” tab that appears on the top of your project edit page when the community is enabled. Anyone you’ve added as a project admin will have full moderation powers on the community by default as well. When you’ve enabled the discussion board, a link will be added to the bottom of your game page and to the top of every download/purchase page. Feel free to add a link to the content of your project’s page for even more exposure to your community. By default we’ve set up all game communities to have a flat category hierarchy by default, but if you need something more advanced like seen in the itch.io global community, please reach out to us and we’d be glad to enable the advanced options for you.